This set includes a Schwinn Brand Toddler Sized Bike Helmet. Helmet has a padded and foam inside with (4 point) adjustable straps and adjustable size-frame in helmet. Helmet is decorated in a light lavender color and features a cute puppy on a background of bones and paw prints. 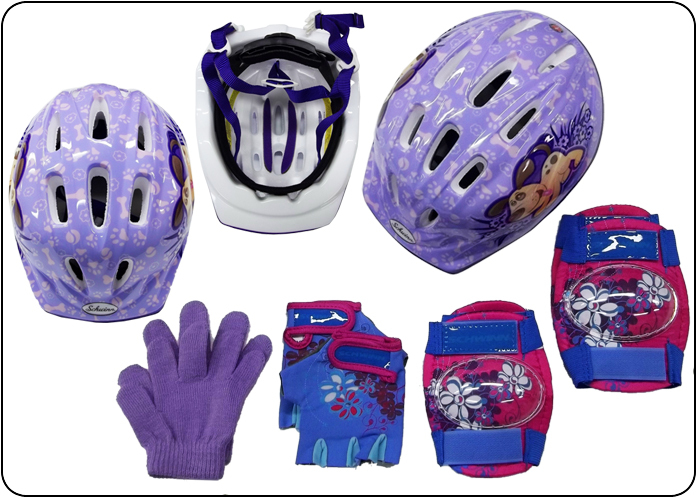 Includes a Premier Toddler sizes Pad Set; knee pads, elbow pads and wrist pads. Pad set is in a (blue, pink, white and lavender colors) all of the Pad Set matches with a flower print. Pad Set features adjust high performance Velcro for adjustment and fit. Elbow and knee pads have pvc centers and soft foam back sides for comfort and protection. This set also includes a pair of our small Stretch Gloves in a nice Lavender color. Machine washable and can be put into the dryer. Keeps hand toasty warm and will stretch with your little one. Toddler Helmet with adjustable straps and helmet size adjuster. Helmet is padded throughout and features a high performance outer shell and foam. Pad Set features durable pvc centers and adjustable Velcro straps. Stretch Gloves solid colored throughout, thicker material, and elastic cuff. All items are constructed very well and built to last.